This Aonuma Interview is All About Zelda, Baby! Fellow gaming site Kotaku just released an interview with Eiji Aonuma and Koji Kondo that they’ve been holding back since before E3 – and it’s all about Zelda. It talks about a lot of things: why music was chosen for the series’ 25th anniversary, Aonuma’s thoughts on patenting gameplay ideas like Z-targeting, and why Link becomes a child again in the ending of Ocarina of Time (that last point may be especially interesting for theorist-minded people like myself). This is the 25th anniversary of The Legend of Zelda. What do you think is the best way for Nintendo to commemorate that milestone? Mr. Aonuma: Zelda has always been a series known for its high-quality music, so we’ve planned an orchestral concert to help people celebrate the 25th anniversary. Music is a passion of both myself and Mr. Miyamoto, and that passion connects to gameplay elements such as Link’s playing of instruments. I would like to give people an opportunity to enjoy music while following the history of the Zelda series with us all the way up to Skyward Sword. 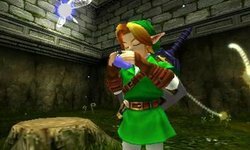 How much do you get in royalties every time another developer uses Z-targeting in their post-Ocarina games? Mr. Aonuma: Recently, it’s been common for new ideas to be patented immediately, and it’s difficult for people to figure out how to escape this situation. While I think that this is the right way for things to be from a business perspective, I also fear that this situation may impede the maturation of new technology. I believe that the process of everyone improving upon great ideas in different ways leads to new ideas. I want the idea of Z-targeting to develop into something even greater through the efforts of many different developers, and I want to keep being one of the developers that improves upon great ideas. How selfless! How bold! Inspiring for a generation! Seriously, though, I’ve always wondered why there tends to be a taboo against reusing certain concepts in video games, at least for a time, while others – typically those that come from Japan – are commonplace. Now I have some insight. Why did Link have to go back to being a kid? He just saved Hyrule. Surely he should be allowed to stay grown up. Mr. Aonuma: Through the guidance of Zelda, Link was able to become a young man without maturing mentally. So Zelda returned Link to his child form once more. I think she wanted him to live a life in which he grew up normally. Also, if Link didn’t return to being a child for us, we wouldn’t have the story of Majora’s Mask, so this is a part of the story that I really want to remain the way it is. Theory-gasm: Sounds like giving Link his childhood back really is the sole driving factor behind Zelda returning Link to the past. Not some pent-up desire to save the past Hyrule, protect the Triforce, or anything like that. There has been much confusion about the ending, particularly because there seem to be mixed messages about the past Link returns to: Zelda instructs him to close the Door of Time, yet when he gets back he seems in some ways to have traveled to a time before he even met her. Meanwhile, the Door of Time does indeed stand open in the Temple of Time. Perhaps now we’ll be able to definitively narrow down the answers to all the questions about the ending, starting with this tidbit from Aonuma. This isn’t the whole interview of course – you can check Aonuma’s answers to many other questions over at Kotaku.